Excel format for number, text, scientific notation, accounting, etc. The tutorial explains the basics of Excel format for number, text, currency, percentage, accounting number, scientific notation, and more. Also, it demonstrate quick ways to format cells in all versions of Excel 2016, 2013, 2010, 2007 and lower. When it comes to formatting cells in Excel, most users know how to apply basic text and numeric formats. But do you know how to display the required number of decimal places or a certain currency symbol, and how to apply just the right scientific notation or accounting number format? And do you know the Excel number format shortcuts to apply the desired formatting in a click? By default, all cells in Microsoft Excel worksheets are formatted with the General format. With the default formatting, anything you input into a cell is usually left as-is and displayed as typed. In some cases, Excel may not display the cell value exactly as you've entered it, though the cell format is left as General. For example, if you type a large number is a narrow column, Excel might display it in the Scientific notation format, something like 2.5E+07. But if you view the number in the formula bar, you will see the original number that you entered (25000000). There are situations when Excel may automatically change the General format to something else based on the value you input in a cell. For example, if you type 1/4/2016 or 1/4, Excel will treat it as a date and change the cell format accordingly. An important thing to remember is that formatting cells in Excel changes only the appearance, or visual representation, of a cell value but not the value itself. For example, if you have number 0.5678 in some cell and you format that cell to display only 2 decimal places, the number will appear as 0.57. But the underlying value won't change, and Excel will use the original value (0.5678) in all calculations. Similarly, you can change the display representation of date and time values the way you want, but Excel will keep the original value (serial numbers for dates and decimal fractions for times) and use those values in all Date and Time functions and other formulas. Whenever you want to modify the appearance of a number or date, display cell borders, change text alignment and orientation, or make any other formatting changes, the Format Cells dialog is the main feature to use. And because it the most used feature to format cells in Excel, Microsoft has made it accessible in a variety of ways. Press Ctrl + 1 shortcut. Right click the cell (or press Shift+F10), and select Format Cells… from the pop-up menu. The Format Cells dialog will show up, and you can start formatting the selected cell(s) by using various options on any of the six tabs. Use this tab to apply the desired format in terms of number, date, currency, time, percentage, fraction, scientific notation, accounting number format or text. The available formatting options vary depending on the selected Category. How many decimal places to display. Specific format for negative numbers. By default, the Excel Number format aligns values right in cells. Tip. Under Sample, you can view a life preview of how the number will be formatted on the sheet. Tip. To quickly apply the default currency format with 2 decimal places, select the cell or range of cells and press the Ctrl+Shift+$ shortcut. 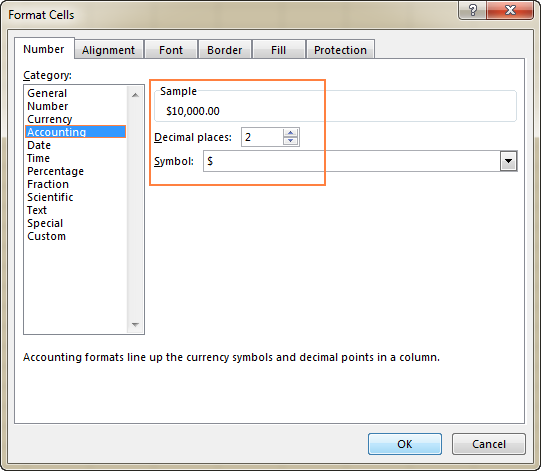 The Excel Currency format places the currency symbol immediately before the first digit in the cell. The Excel Accounting number format aligns the currency symbol on the left and the values on the right, zeros as displayed as dashes. Tip. Some of the most often used Accounting format options are also available on the ribbon. For more details, please see Accounting format options on the ribbon. 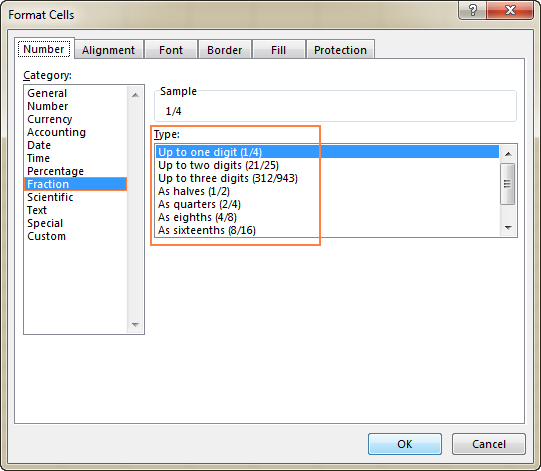 The Percentage format displays the cell value with a percent symbol. The only option that you can change is the number of decimal places. To quickly apply the Percentage format with no decimal places, use the Ctrl+Shift+% shortcut. Note. If you apply the Percentage format to the existing numbers, the numbers will be multiplied by 100. For more information, please see How to show percentages in Excel. Note. When typing a fraction in a cell that is not formatted as Fraction, you may have to type a zero and a space before the fractional part. 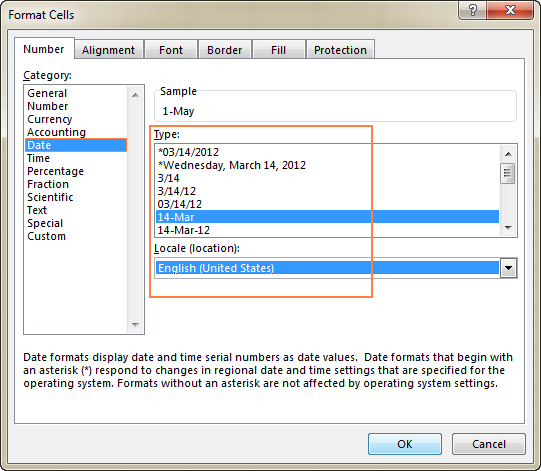 For example, if you type 1/8 is a cell formatted as General, Excel will convert it to a date (08-Jan). To input the fraction, type 0 1/8 in the cell. The Scientific format (also referred to as Standard or Standard Index form ) is a compact way to display very large or very small numbers. It is commonly used by mathematicians, engineers, and scientists. For example, instead of writing 0.0000000012, you can write 1.2 x 10-9. And if you apply the Excel Scientific notation format to the cell containing 0.0000000012, the number will be displayed as 1.2E-09. To quickly apply the default Excel Scientific notation format with 2 decimal places, press Ctrl+Shift+^ on the keyboard. When a cell is formatted as Text, Excel will treat the cell value as a text string, even if you input a number or date. By default, the Excel Text format aligns values left in a cell. 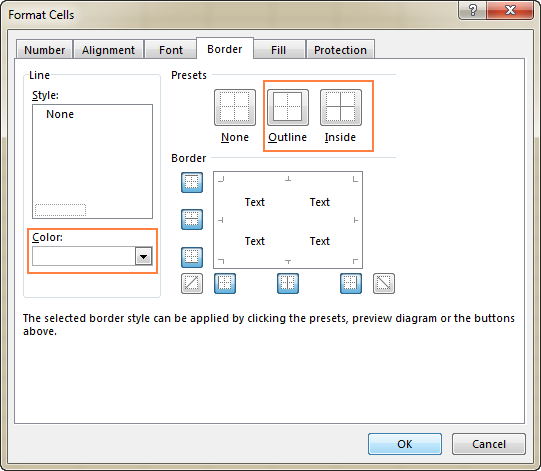 When applying the Text format to selected cells via the Format Cells dialog window, there is no option to be changed. Please keep in mind that the Excel Text format applied to numbers or dates prevents them from being used in Excel functions and calculations. Numerical values formatted as text force little green triangle to appear in the top-left corner of the cells indicating that something might be wrong with the cell format. And if your seemingly correct Excel formula is not working or returning a wrong result, one of the first things to check is numbers formatted as text. 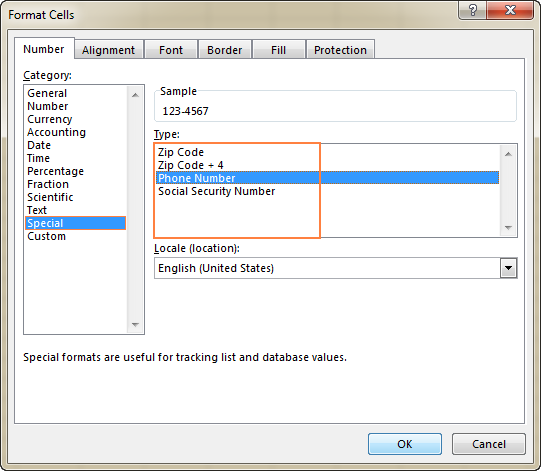 To fix text-numbers, setting the cell format to General or Number is not sufficient. The easiest way to convert text to number is select the problematic cell(s), click the warning sign that appears, and then click Convert to Number in the pop-up menu. A few other methods are described in How to convert text-formatted digits to number. If none of the inbuilt formats displays the data the way you want, you can create your own format for numbers, dates and times. You can do this either by modifying one of the predefined formats close to your desired result, or by using the formatting symbols in your own combinations. In the next article, we will provide the detailed guidance and examples to create a custom number format in Excel. 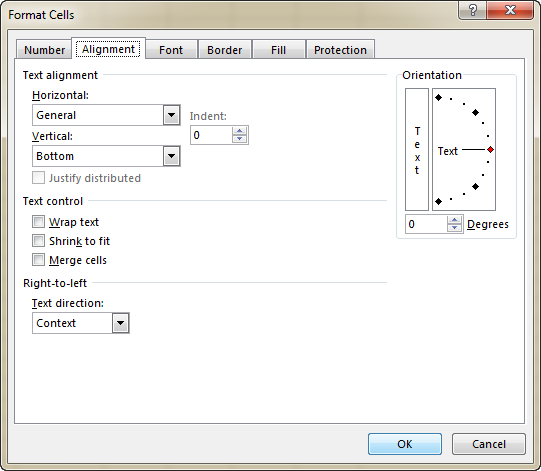 Align the cell contents horizontally, vertically, or centered. Also, you can center the value across selection (a great alternative to merging cells!) or indent from any edge of the cell. Wrap text into multiple lines depending on the column width and the length of the cell contents. Shrink to fit - this option automatically reduces the apparent font size so that all data in a cell fits in the column without wrapping. 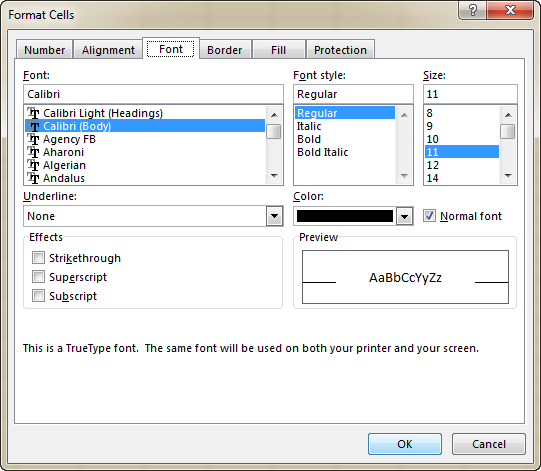 The real font size applied to a cell is not changed. Merge two or more cells into a single cell. Change the text direction to define reading order and alignment. The default setting is Context, but you can change it to Right-to-Left or Left-to-Right. Change the text orientation. A positive number input in the Degrees box rotates the cell contents from lower left to upper right, and a negative degree performs the rotation from upper left to lower right. This option may not be available if other alignment options are selected for a given cell. Use the Border tab options to create a border around selected cells in a color and style of your choosing. If you don't want to remove the existing border, select None. 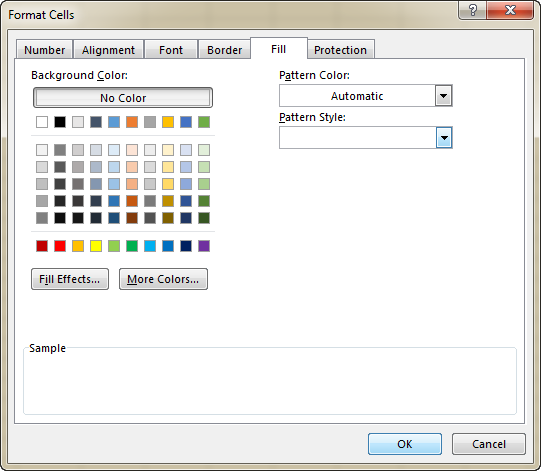 By using the options of this tab, you can fill cells with different colors, patterns, and special fill effects. As you have just seen, the Format Cells dialog provides a great variety of formatting options. For our convenience, the most frequently used features are also available on the ribbon. Select a cell or a range of cells whose format you want to change. 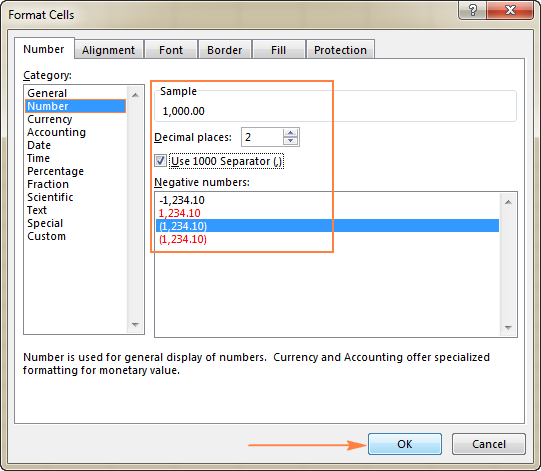 To apply Excel Accounting number format with the default currency symbol, select a cell(s), and click the Accounting Number Format icon . To choose the currency symbol, click the arrow next to the Accounting Number icon, and select a required currency from the list. 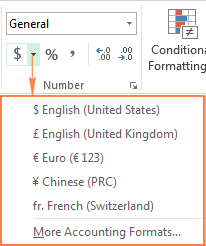 If you want to use some other currency symbol, click More Accounting Formats… at the end of the list, this will open the Format Cells dialog with more options. To use the thousands separator, click the icon with a comma . 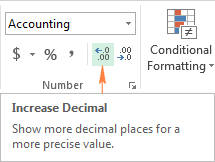 To display more or fewer decimal places, click the Increase Decimal or Decrease Decimal icon, respectively. This option can be used for Excel Accounting format as well as for Number, Percentage and Currency formats. On the Home tab of the Excel ribbon, you can find far more formatting options such as changing cell borders, fill and font colors, alignment, text orientation, and so on. If you have closely followed the previous parts of this tutorial, you already know most of the Excel formatting shortcuts. The table below provides a summary. Ctrl+Shift+! Number format with a thousand separator and two decimal places. The cell is not wide enough to display the data in the selected format. To fix it, all you need to do is increase the column width by dragging the right boundary. Or, double-click the right boundary to automatically resize the column to fit the largest value within the column. A cell contains a negative date or a date outside the supported date range (1/1/1900 through 12/31/9999). This is how you use basic number formatting options in Excel. 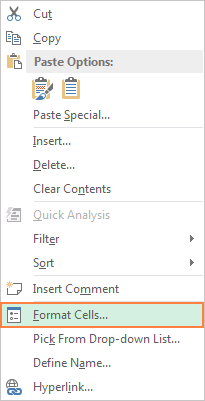 In the next tutorial, we will discuss the fastest ways to copy and clear cell formatting, and after that explorer advanced techniques to create custom numbers formats. I thank you for reading and hope to see you again next week! 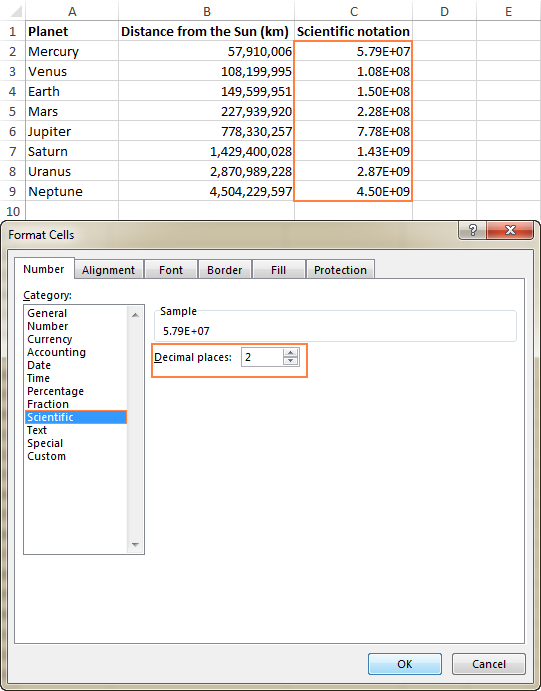 12 Responses to "How to format cells in Excel (number, text, scientific notation, etc.)" how to covert Hijri date to Gregorian date. please give me correct formula for excel 2010. Example : 12/10/1437 output in Gregorian ???? any way thanks for cooperation. i have the vb codes but need sample formula witch is did easy. Just a tip regarding the Custom number format - if you have a cell or column that requires a certain number of digits, enter that many zeroes in the "Type" box. If the number is less than that number of digits, it will add leading zeroes to the number. For example, type set to ten zeroes (0000000000) and entry of number 123456 will display as 0000123456. This also works for long number strings too, where Excel tries to display the number in scientific notation. I often work with 12-digit numbers, and entering 12 zeroes in the type makes Excel display the full number in the cell. Thank you for this tip, Mikey! In my Excel sheets, I usuall have a large number of large integer values. Usually, it is a hassle to go "Numbers format", scroll down to "other", check the thousand separator box, and klick twice on the number of decimals, and then press OK. I was very happy to find above the shortcut to set a format with a thousand separator and two decimals, since it will remove several steps from the above, but I still need to press the tool bar button for "fewer decimals" twice. Is there any way to get Excel to have 0 decimals and thousand separator as a default? BTW, I am a happy customer of Ablebit plugins, the merge tables function has saved me many days of tedious work! Please specify what exactly you want to remove from Excel.